Orphan Black continues at high speed in the second half of the season with Ruthless in Purpose, and Insidious in Method being one of the best episodes of the season. There was the return of another clone as Tatiana Maslany once again played Krystal, the manicurist who fears twins and clowns who was seen in the first episode with Rudy and Seth. This also provided a different situation in which a character got to act as someone else, in this case Felix acting as a straight guy hitting on Krystal. Krystal turned out to not entirely be the bubbly air head as she was portrayed as, although unaware of being a clone, or having slept with clones, realized something is up and was investigating. Unfortunately this did not work out very well for poor Krystal as Rachel was up to far more than anyone realized, and managed to play everyone against everyone else to get what she wanted, including Krystal’s body to hide her escape. It will be good to see Rachel back as a powerful antagonist, but I was hoping she might keep the eye patch. Alison’s Weeds story line continues to be mostly independent of the other story lines but they continue to find ways to fit it into the rest of the show. Previously Cosima had to impersonate Alison. This week the connection is that it is their turn to host Helena, who was also reunited with Gracie. And Castor woke from slumber. The original has a number. And the number is H46239, which I’m sure we will learn more about later. Hannibal began the third season with an Antipasto which was served to partially reset the show. Instead of Baltimore, the episode takes place in Florence, after a stop over in Paris. It is a much slower episode after the bloody season finale from season two. While it was implied that Will Graham and perhaps others survived, most of the major characters from the first two seasons were not seen. The exception was flashbacks to the final days of Dr. Abel Gideon, which was primarily to provide insight into Hannibal’s mind. 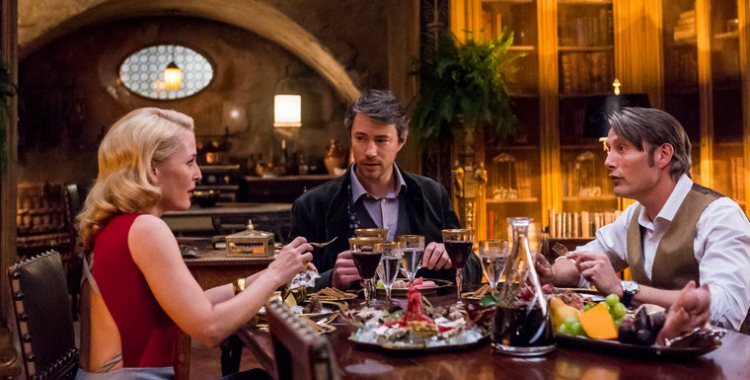 Of course Hannibal did invite someone over for dinner, and it was obvious as to what that ultimately means. 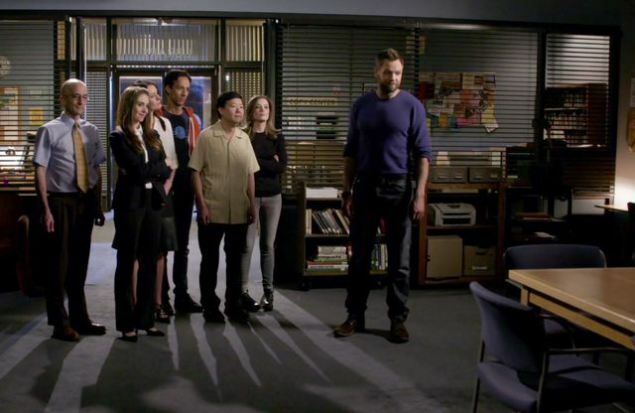 Community concluded its sixth season with one of its more meta episodes, pondering what a seventh season might be, and ending with the hashtag #AndaMovie. The episode could very easily work as a season finale or as a lead in to whatever Dan Harmon decides to do next. It sounds like he is taking a break, but that Yahoo! would be quite happy to put on another season if he writes it. Getting the cast together for another season might be difficult due to other obligations, suggesting that six seasons and a movie might be the most likely outcome after all, but a seventh season remains a possibility. Dan Harmon has responded to the question saying, “I told Yahoo, ‘I can’t think about writing a movie until I miss Community,” Harmon said. “They wanted to turn around a do a movie immediately, and Yahoo can get it done. They’re like the NSA.” Joel McHale will have a guest role on the X-Files revival, and when on Conan seemed more interested in a movie. Making matters more difficult for a seventh season, Gillian Jacobs and Ken Jeong have roles in other series. Both Annie and Abed were leaving at the end, but it was left open whether they might later return. Personally I’d watch a show centered around Jeff and Annie, along Abed, the Dean, and any other characters who are still available. That was a rather emotional finale, and true to Community form, very meta. What were you hoping to accomplish with the season ender? It was a meta explosion. I never know what it is I want to say, I just know of areas I want to explore. Community was the show that commented on itself the whole time, and for the last episode of Season 6 the goal isn’t to lure new viewers, so might as well really lean into this thing and talk about what’s on everybody’s mind, since the conversation about Community has always been more intense than the conversation about the characters. So we had the characters talk about the future of the show as if it were a show. Other than that, it had a pretty traditional structure: It was an excuse to explore possibilities, only to realize there’s absolutely no way we can control anything. Also if we want these characters to continue to grow, they’re missing a huge part of their life right now. Annie is an exceptional person. I want Annie to taste the world. Jeff Winger had the most idealistic dream of everyone staying at Greendale as faculty colleagues. That actually would be a device you could use for another season–but that would mean that none of these characters get to really grow or ever leave. I do agree with Winger that that show makes more sense than the one I originally pitched, because then they all have a reason to be together. They would have a reason to have meetings, and then it would be Boston Public set at Greendale. Annie and Abed leave the group at the end of the episode to pursue their dreams. Why them? I think Britta’s future can still be found at Greendale and I don’t think there’s anything sad about that. She lived in New York. She was the wild horse that galloped around and then came slinking back to community college. So she has sown her oats and still needs to grow up, just like Jeff does. In the original idea, there were three characters – Abed, Annie and Troy – who represented the younger stories you might encounter at a community college. Those are stories about transitions. Other stories can be about falls from grace. They were wayward youth. On the off chance that it’s the last image of the show that we ever see, I felt more comfortable with the image of Abed and Annie going off to an airport, where they might go anywhere or do anything. It made me feel better about the eternity of the show. Let’s talk about the Annie and Winger relationship and that kiss. There’s still a big age gap between the two, but on an emotional scale they’re on the same level. Yeah, with each passing year it gets a little less creepy. I did just marry a 29 year old at 42. And in real life, Allison Brie is 43. No. I just wanted her to read that and freak out. I have no idea how old Allison is. Age aside, it’s more an issue of how much life experience you have had. Do we really believe in our heart of hearts that the current version of Jeff Winger and the current version of Annie Edison would be happily ever after if they ever got together? Or is it more likely their souls are intermingled and there is such a thing as true love that is genuinely star crossed? This person hasn’t lived their life yet. I’m comfortable with the realization that he’s genuinely in love with her, but that’s a separate thing from whether that’s actually good for her. This episode has the feel of a series finale, but you had to leave the door open in the event of a seventh season or a movie. Are you leaning toward the movie option? You made a point of not changing Community‘s language or content this season, even though you were no longer confined by broadcast standards. But you ended up with two “fucks” in the finale! I did! It was kind of unintentional. That one that Jim [Rash, as Dean Pelton] does is adlibbed. As soon as he said it, the entire cast started laughing, but I edited around it. As for Britta’s I should have bleeped it… it’s weird to have two “fucks” on that one. The show, especially the Chang and Dean Pelton characters, was more grounded this season. I think it was more emotionally grounded, but structurally, ironically everything was a lot looser. I think I’ve become a victim of my own story structure. The lack of a clock at Yahoo, a really strict one, allowed for something I think the show needed in order for it to continue to feel healthy. A certain randomness. The stories don’t resolve the way you always think they might. There are these strange slingshots around the sun. The wedding episode ends randomly with Chang being the hero. I was a little more British this year. If I buy a Honda CR-V [which played a major role in Season 6, particularly in the episode “Advanced Safety Features”] and drop your name, do you get a cut? I’m still waiting for my jacket. I told them I wanted the Honda jacket that Jim wears in the episode. The last episode ends with a faux Community board game advertisement, which ends up diving into your own stream of consciousness. You even did the voice over. Is that a snapshot of how you were feeling as the season ended? Well, I certainly did that voice over just two days ago. Everybody had to talk me into doing it. I kept saying, “It’s not funny if it’s me.” Then I tried it. That is my throat catching in a genuine way. But I don’t know, I want to wait and see. I’ve never had a relationship this long. I’ve never done anything for six years, except drink. 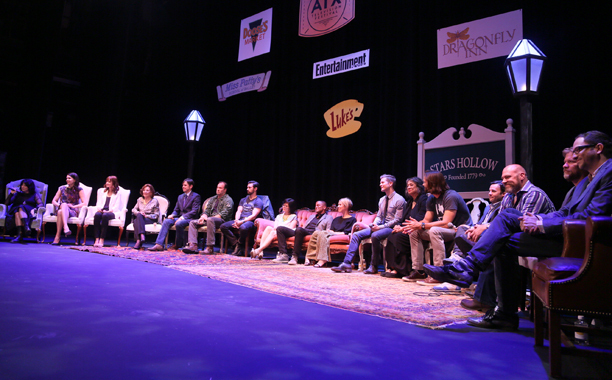 The cast of Gilmore Girls, along with the show’s creator Amy Sherman-Palladino got together at the ATX TV Festival. Unfortunately there is still no plans for the long-rumored movie reunion, but hope was kept alive. At least the cast still gets along and nobody really objects to working on it. Amy Sherman-Palladino also said she will not reveal the final four words with which she had planned to end the series until she is on her death bed. This remains a mystery as she left the show for the final season, so her planned finale was never aired. The cast did discuss where they think their character would be today. John Noble has been cast as Sherlock’s estranged father on season four of Elementary. The Nebula Awards winners were announced. The award for best novel went to Annihilation, by Jeff VanderMeer. The full list of winners is here. Posted in Science Fiction, Television. Tags: Alexis Bledel, Alison Brie, Amy Sherman Palladino, Community, Conan O'Brien, Gillian Anderson, Gillian Jacobs, Gilmore Girls, Hannibal, Joel McHale, John Harmon, John Noble, Lauren Graham, Orphan Black, Science Fiction, Tatiana Maslany. RSS feed for comments on this post.. TrackBack URL.